There aren’t many things I love more in the world that macaroni and cheese. Don’t make me choose! Choosing a favorite food is like trying to choose a favorite movie. Or a favorite song. Or book. I used white pasta. Sue me. Sometimes it’s just so good in mac ‘n cheese. My inner Mother Lovett refused whole wheat this time. Using the white pasta added a more creamy taste and softness to the dish. 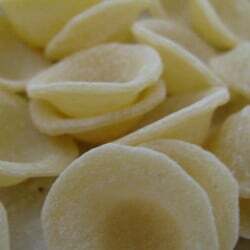 Orecchiette is my favorite. I love, love, love this apple smoked cheddar cheese. I eat it on just about everything. Just look at how cute the pasta is. My roux – a la Mother Lovett. To possibly make things even less healthier, I added a heavy dose of heavy cream. It looked heavy. And creamy. I grated the cheese myself. It melts easier, and I prefer to grate my own. I think it tastes better. A touch of nutmeg. Just because. To test the creaminess, dip a spoon in and judge for yourself. I dipped about 67 spoons. My favorite – applewood smoked bacon. I just ripped it apart with my hands. Have you had any panko in your life recently? If not, please get some. See the cheese sauce bubbling in the corner? This was fresh out of the oven. Ok calm down. A few spoonfuls of this won’t clog your arteries. Eating this entire 2-person casserole dish stuffed with smoked cheddar bacon mac 3 days a week might, but I don’t know anyone who would do that. I like to test my limits. 1-2 cups grated smoked cheddar cheese – depends on desired consistency. Cook your bacon – either pan fry or bake it. Baking it was easier since I already had a few other pans going on the stove. Once cooked, let drain on a paper towel, then chop into tiny bits. Boil salted water & add pasta when ready. Cook & remove. Set aside. In a small saucepan on low-medium heat, whisk 1 tablespoon butter and 1 tablespoon flour to create a roux. Add half of heavy cream and half of chicken stock. Add in half of the smoked cheddar cheddar cheese. Continuously stir so cheese does not stick to bottom. Alternately add more cheese, heavy cream and chicken stock until you reach desired consistency. Add a pinch of nutmeg and salt and pepper to taste if desired. Layer pasta and half of bacon in a casserole dish. Add cream sauce over top. Sprinkle on remaining bacon and panko breadcrumbs. Bake at 400 for about 15-20 minutes, or until top is golden brown. I’m drooling. That looks awesome! mmm mac and cheese is one of those things that just shouldnt be healthy. it should be full of butter. and bacon. I have a shirt that says I love Cheese! I am a proud Wisconsin girl! ummm i just looked at your about me page, and you are RIPPED!!! i love that you balance your life with yummy indulgences and healthy eats/exercise. happy halloween!!! sorry you didnt have as many t-n-t’ers as you would have wished. Thx for the comments on my bloggie as always and understanding commenting can be soo time consuming, you know for sure how it is! I made a similar dish for my clients last week. I kept getting texts: “this is so good”, “are you going to make us fat?”, “can’t stop eating”, “no, really, we can’t”. The magic of cheese and bacon. Sweet mercy that looks tasty. You owe me a new keyboard cos I just drooled all over mine. I know you posted this last year, but I found this today and decided this was what I was going to make for me and the hubby. Oh…My…Gosh! It was fabulous. The cheese sauce was perfect and the fact that I had everything on hand except the heavy cream was also awesome! The only thing I had different in the recipe was I used turkey bacon and bow-tie pasta since that’s what I had on hand and wanted to use up. It was so yummy! I am so glad you liked it! Definitely one of my favorite dishes. So I’m having a secret love affair with cheese, and pasta…I really enjoy your recipes, they’re quite entertaining. Also, you make a good comedian, I would go to any standup act you choose to perform. Luckily, my arteries aren’t clogged from looking at photos, but that might change after I make every single one of these pasta dishes. Merci beaucoup, madame, je t’aime, et ton cusiner. Time to slaugher some oink oinks so I can have my own dish. I made this last night. Holy cow!! It’s the best mac and cheese I’ve ever had! Seriously…I mean EVER!! I made this last night, but added cubed chicken breast to make it our main meal. I also used penne noodles. It was very easy and very good! Great comfort food. Hubby said it needed more bacon. What a man. I just made this for the boyf, pretty sure I just sealed the deal for marriage. Thanks for an amazingly delish recipe! I made this yesterday and it was sooooooooo good!!!!! We had the leftovers for lunch today – wow! It reheated really well, and I will definitely be making it again.